Liu Y, Aryee MJ, Padyukov L, et al. Nat Biotechnol. 2013 Jan 20;31(2):142-7. http://dx.doi.org/10.1038/nbt.2487. Epub 2013 Jan 20.
other influences are even more important. defined as heritable changes in the genome without changes in DNA sequences. Epigenome-wide association data implicate DNA methylation. CD40 [9,10], B-lymphocyte kinase (BLK) and the NF-kB family member c-Rel . Aside from HLA-DRB1 and PTPN22, the effects are weak (odds ratio (OR) < 1.3). Most of these loci are also implicated as risk factors in other autoimmune phenotypes . there are two independent autoimmune associated regions within the KIAA1109-TENR-IL2-IL21 gene cluster. publicly-available data from the Wellcome Trust Case Control Consortium (WTCCC). has been associated with rheumatoid arthritis (RA). including type 1 diabetes (T1D). evaluate whether or not there were effects independent of rs6822844 on RA at the KIAA1109-TENR-IL2-IL21 locus. genotyped for rs6822844, rs17388568 and rs907715. Meta-analysis of these data with published and publicly-available data was conducted using STATA. using the program IMPUTE  and HapMap (NCBI Build 36 (db126b)) CEU data as reference haplotype set. Of the Australasian case sample set, 99.1% of subjects for rs6822844, 99.1% of subjects for rs17388568 and 98.9% of subjects for rs9077015 were successfully genotyped and, for the 505 member control sample set, 97.4% of subjects for rs6822844, 99.4% of subjects for rs17388568 and 99.4% of subjects for rs9077015 were successfully genotyped. The remaining New Zealand control genotypes (n = 610) were obtained from the genome-wide data, with 100% successfully genotyped for rs17388568 and 99.6% imputed for rs6822844 and rs907715. Testing for departures from Hardy-Weinberg equilibrium, for the significance of any difference in minor allele frequencies between patients and controls, calculating odds ratios and conditional association testing was done using the PLINK software package. Logistic regression analysis was applied to the Australasian case-control sample set to stratify data according to gender, RF, CCP and SE status using the STATA 8.0 data analysis and statistics software package (StataCorp, College Station, Texas, USA). Meta-analysis was done using the STATA 8.0 metan software package and cumulative P- values reported. The Mantel-Haenszel test was used to estimate the average conditional common odds ratio between these two independent cohorts and to test for heterogeneity between the groups. P- values from the North American Rheumatoid Arthritis Consortium (NARAC) study, which could not be combined using meta-analysis owing to unavailability of allele counts, were combined using Fisher’s method. there was a genome-wide level of significance supporting association of rs6822844 with RA (OR = 0.86 (0.82 to 0.91), P = 8.8 × 10-8, P = 2.1 × 10-8 including NARAC data). trend towards association (OR = 0.93 (0.87 to 1.00), P = 0.07). this trend wasnot independent of the association at rs6822844. for rs6822844 playing a role in the development of RA (OR = 0.86 (0.82 to 0.91), P = 8.8 × 10-8). The NARAC GWAS data (OR rs6822844 = 0.84 (0.74-0.96), P = 0.011)  were combined with the meta-analysis result, yielding P = 2.1 × 10-8. 20th locus for which there is a genome-wide (P ≤ 5 ×10-8) level of support for association with RA. confers susceptibility to other autoimmune phenotypes with a heterogeneous pattern of association. 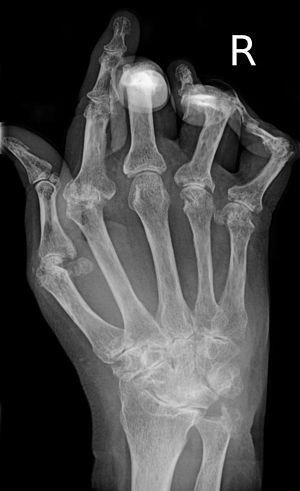 appear to play a role in the development of rheumatoid arthritis. These results were published in Nature Biotechnology. Genes play an important role in rheumatoid arthritis (RA) and many other common chronic diseases, but often do not tell the entire story. Factors that regulate the activity of genes are also thought to be important. These factors include chemical tags that bind to DNA. while other tags may occur as a result of the disease. researchers conducted a study among a group of people with RA and a comparison group of people without RA. The researchers were able to identify DNA sites that were tagged differently in people with RA and that appeared to affect the risk of RA. Most of these sites were in an area of the genome that has been linked with autoimmune disease. current treatments often involve suppressing the entire immune system, which can have serious side effects. A genetic variation has been identified that increases the risk of two chronic, autoimmune inflammatory diseases: rheumatoid arthritis (RA) and systemic lupus erythematosus (lupus). These research findings result from a long-time collaboration between the Intramural Research Program of the National Institute of Arthritis and Musculoskeletal and Skin Diseases and other organizations. These results appear in the Sept. 6 issue of the New England Journal of Medicine. for association with disease in large collections of RA and lupus patients and controls. in a large segment of the STAT4 gene. The STAT4 gene encodes a protein that plays an important role in the regulation and activation of certain cells of the immune system. says coauthor and NARAC principal investigator Peter K. Gregersen, M.D., of The Feinstein Institute for Medical Research, in Manhasset, N.Y.
One variant form of the gene was present at a significantly higher frequency in RA patient samples from the North American Rheumatoid Arthritis Consortium (NARAC) as compared with controls. even more strongly linked with lupus in three independent collections of patients and controls. a shared disease pathway for RA and lupus. in a genetic association study, identified a disease susceptibility gene,” says Dr. Gregersen. it is very exciting to know that this gene plays a fundamental role in these important autoimmune diseases. 1. Monoclonal IgG antibodies generated from joint-derived B cells of RA patients have a strong bias toward citrullinated autoantigen recognition. Amara K, Steen J, Murray F, Morbach H, Fernandez-Rodriguez BM, Joshua V, Engström M, Snir O, Israelsson L, Catrina AI, Wardemann H, Corti D, Meffre E, Klareskog L, Malmström V.
2. Ambient air pollution exposures and risk of rheumatoid arthritis in the Nurses’ Health Study. Hart JE, Källberg H, Laden F, Costenbader KH, Yanosky JD, Klareskog L, Alfredsson L, Karlson EW. 3. Epigenome-wide association data implicate DNA methylation as an intermediary of genetic risk in rheumatoid arthritis. Liu Y, Aryee MJ, Padyukov L, Fallin MD, Hesselberg E, Runarsson A, Reinius L, Acevedo N, Taub M, Ronninger M, Shchetynsky K, Scheynius A, Kere J, Alfredsson L, Klareskog L, Ekström TJ, Feinberg AP. 4. Multiplex analyses of antibodies against citrullinated peptides in individuals prior to development of rheumatoid arthritis. Brink M, Hansson M, Mathsson L, Jakobsson PJ, Holmdahl R, Hallmans G, Stenlund H, Rönnelid J, Klareskog L, Dahlqvist SR.
5. Rare, low-frequency, and common variants in the protein-coding sequence of biological candidate genes from GWASs contribute to risk of rheumatoid arthritis. Diogo D, Kurreeman F, Stahl EA, Liao KP, Gupta N, Greenberg JD, Rivas MA, …Alfredsson L; CRRNA; RACI, Sunyaev S, Martin J,…, Klareskog L, Padyukov L, Raychaudhuri S, Plenge RM. 6. Genetic variation in the serotonin receptor gene affects immune responses in rheumatoid arthritis. Snir O, Hesselberg E, Amoudruz P, Klareskog L, … Padyukov L, Malmström V, Seddighzadeh M.
7. Polymorphisms in peptidylarginine deiminase associate with rheumatoid arthritis in diverse Asian populations: evidence from MyEIRA study and meta-analysis. Too CL, Murad S, …, Alfredsson L, Klareskog L, Padyukov L.
8. High-density genetic mapping identifies new susceptibility loci for rheumatoid arthritis. Eyre S, Bowes J, Diogo D, Lee A, Barton A, Martin P,…; BRAGGSS; Wellcome Trust Case Control Consortium, … Klareskog L, Gregersen PK, Worthington J. 9. The Swedish twin registry: establishment of a biobank and other recent developments. Magnusson PK, Almqvist C, Rahman I, Ganna A, …Ingelsson E, Klareskog L, de Faire U, Pedersen NL, Lichtenstein P.
10. Validation of a multiplex chip-based assay for the detection of autoantibodies against citrullinated peptides. Hansson M, Mathsson L, Schlederer T, …, Klareskog L, Rönnelid J.